How do you change up your tees? Gabe is on spring break this week which means we will be taking advantage of his time off with some mini day trips:) Needless to say its very difficult for me to focus on work. Love having him home to enjoy the sun with! Thanks for all your positive feedback on the new Saturday series. Again, you all are wonderful. Have a great start to your week friends! P.S. Will you be watching the national championship game tonight?? I can hardly stand it I am so excited...UK Wildcats are me team!! I have a good feeling about this one. GO BIG BLUE! A lookbook for the modern modeste. Nice job hon! Each look is great! I adore how it looks with the first skirt and all the other ones but that first one got my attention big time. love the last one, but they're all great! enjoy your time with your hubby! You are too cute Anna! i gotta get on this maxi trend. perfect with a plain white tee. i live in my target tee. you are a knockout! perfecto style!! ohhh i LOVE this!! i have a few staple tees but don't know how to style them!!! Love the printed skirt! I just went to Gap a few weeks ago during their 40% off sale and stocked up on a ton of tee's! LOVE it all, Anna. You are GOOOOOOD girl!!! Love all the styling options! I can't even tell you how many white t shirts I have in my closet, it's one of my favorite staples. I love all of the looks! So lovely. Just found your blog! Love the t-shirt with the maxi skirt, I never think of this I'm more of a t-shirt with jeans or shorts type! White t shirts are the best! I love all these looks- especially the tribal print skirt and the pink maxi skirt! Too cute. I love the maxi skirt, gorgeous! Okay, they are all lovely Anna, but I really do like the tee and the maxi best. Such a pretty look! Hope your week is off to a fantastic start! anna you are so cute, i couldn't possibly choose a favorite out of these! hope you enjoy your week with the hubs! I love that all the necklaces you're wearing too! I love them all. If I had to pick one (which is hard to do) I'd have to go with the jeans. Jeans and white tee - it's so timeless. I love it. all three are wonderful! i wear a white tee with almost anything! i probably wear them too much actually! I love white tees - they can be so casual yet chic all at the same time. Love all of the looks, but the last one is such a great inspiration for me. 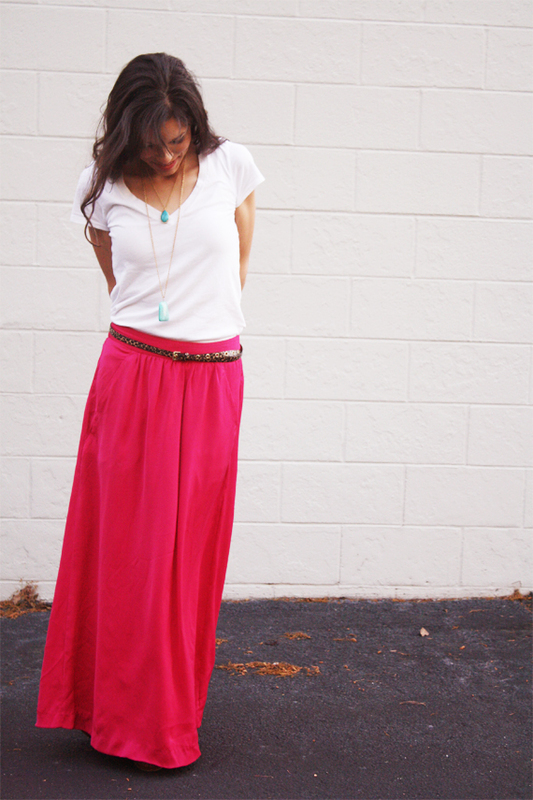 I've been wanting to try a maxi skirt, and this is the perfect look to shoot for! thanks! omgosh! where to begin?!. i need to invest in a white tee. thats for starters lol. im in love with your black strap heels and your hat! and your super adorable necklace. and that skirt...divine! need these items pronto lol. super cute! I love pairing my tees with vests. Suit vests and chunky knit ones. They add some great depth to white tees :) And I hope you guys have a great week! Yay for break!! 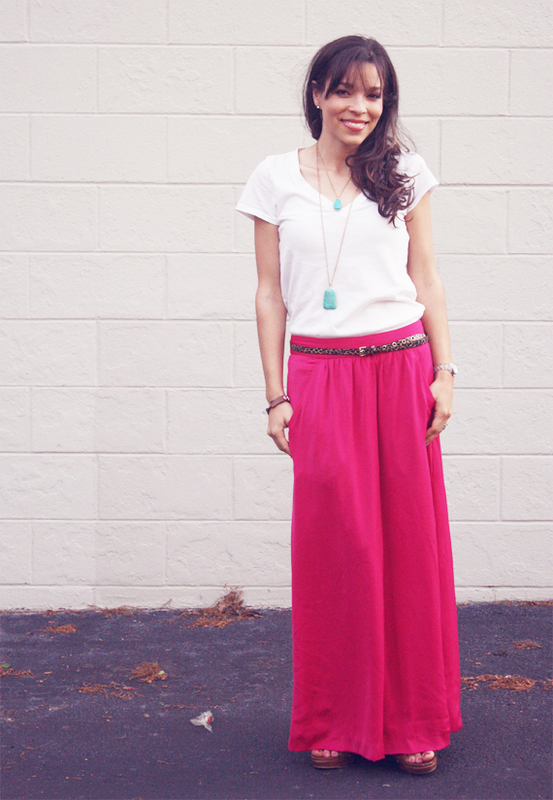 I love how versatile white tees are :-) That pink maxi is gorgeous! The T is definitely a staple! I love the first skirt you paired it with, and that hat is too cute! great post!! i love how versatile a white tee is. it is definitely a closet staple. my favorite is the tee with jeans and the fedora. you look super cute! why is it that the classic white tee and jeans (and now maxi and printed skirt!) always look so great??? I love the first look -- that skirt is just too cute on you. My husband is a HUGE Wildcats fan so he's rooting for them along with you! What a great post, Anna! 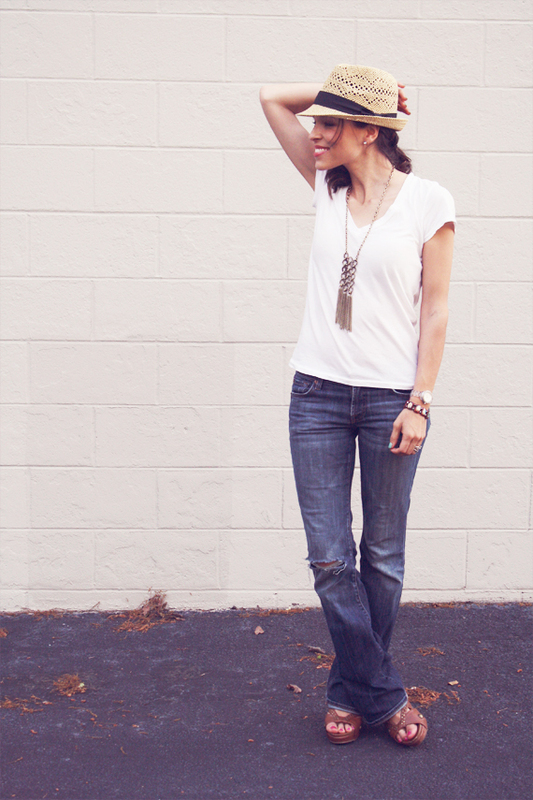 I love how versatile a white tee is, and the ways you styled it up are totally steal-worthy. Although I'm from Kansas, I'm cheering for your team tonight--KU is my rival school! i love a great fitting white tee... and these looks are totally fab! love that necklace and that skirt is pretty amaze too! Love all these looks - a white tee is such a great staple! Also, I'm with you on UK! I have them picked to win it all! Good job. I love the maxi look; turquoise and pink look amazing. Every outfit looks so effortless. I love that skirt! Must buy one. Oh I love it all!! love this Anna, love all three combo! I am such a white tee and jeans type of girl! All i need now is get myself a fedora hat! I just paired a tee and maxi together last week! I don't know why I'd never done before, but I liked it! =) So pretty Anna! white tee and a maxi skirt is hands down the best! i like it with jeans, but you're right, a solid white tee goes with pretty much everything. Love your tribal skirt, straw hat, and maxi skirt. Beautiful! love love love the last two!! Those wedges you're wearing in #2 are fantastic! LOVE the basic jeans and tee ;) you are way too stylish !! I LOVE all these outfits..! you're so pretty ! Loving all of your looks! I think I need a new tee! Love it!